An account ledger for the R. W. Estes Celery Company, Estes' personal accounts, and the personal accounts of Estes' wife, Ruth H. Estes. R. W. Estes Celery Company was a celery growing and shipping business in Oviedo, Florida. The R. W. Estes Celery Company Precooler Historic District is located at 159 North Central Avenue and was added to the U.S. National Register of Historic Places on September 20, 2001. Original ledger: Oviedo Historical Society, Oviedo, Florida. 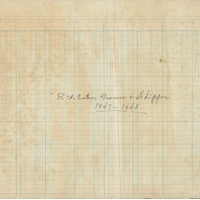 Digital reproduction of original ledger. Originally created by R. W. Estes Celery Company. Donated to the Oviedo Historical Society in 2015. Copyright to this resource is held the Oviedo Historical Society and is provided here by RICHES of Central Florida for educational purposes only. "FLORIDA - Seminole County - Historic Districts ." National Register of Historic Places. http://www.nationalregisterofhistoricplaces.com/FL/Seminole/districts.html. R. W. Estes Celery Company. “R. W. Estes Celery Company Ledger, 1947-1950.” RICHES of Central Florida accessed April 22, 2019, https://richesmi.cah.ucf.edu/omeka/items/show/5415.